The classical antenna-array, for the reception of a distant UHF station, consists of a large diameter (high-gain) parabolic antenna and an antenna-mounted single channel, high-gain, low-noise preamplifier. There is no need to discuss the use of a high-gain antenna. In reference to the preamplifier it should be noted that antenna mounted preamps can eliminate antenna downlead insertion losses, occasionally in the 4 to 5 dB range, and the low Noise Figure of the preamplifier will improve the Carrier/Noise Ratio. For many years such a “classical” installation was in operation in York, Pa., carrying the signals of WPHL, Channel 17, Philadelphia, a popular sport event station. 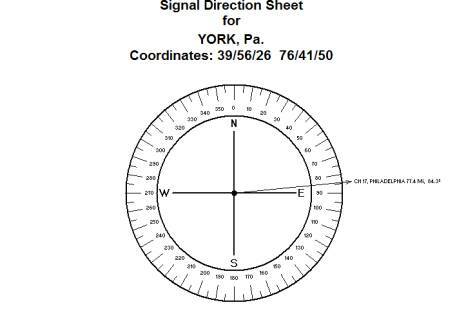 The signals were received from a distance of 77.4 miles, as shown on the computer generated Signal Direction Sheet below. The system used an 8’ high Zig-Zag antenna, installed at 275’ above ground, on a 300’ high self-supporting tower. This antenna, without preamplifier, delivered a +1.2 dBmV amplitude Channel 17 video carrier at the end of the antenna downlead - under favorable weather conditions. When the tower was covered by snow or ice, the signal level dropped 10 to 15 dB, producing inferior picture quality. The introduction of HDTV in the York CATV system provided the perfect opportunity for the re-examination of antenna reception requirements. A computer aided TV reception study confirmed that Channel 54, the DTV affiliate of Channel 17, Philadelphia, can be received from the same direction. The analog and DTV transmitters are co-located. The task: the narrow-band Zig-Zag antenna should be replaced by a broad-band, high-gain antenna, such as an 8’ diameter parabolic. The photograph above documents conditions after the installation of the 8’ parabolic. The Channel 17 video carrier, appearing in the center of the screen, exhibited an amplitude of +2.8 dBmV on a fair weather day. The following night weather and reception conditions changed dramatically. The tower was covered in the morning with snow and ice. 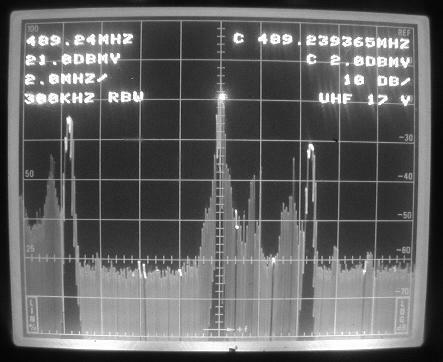 The picture below, taken from the screen of the TEKTRONIX Model 2710 spectrum analyzer is the perfect proof that the Channel 17 reception was not affected by inclement weather conditions. The Channel 17 video carrier amplitude was measured as +3.3 dBmV. 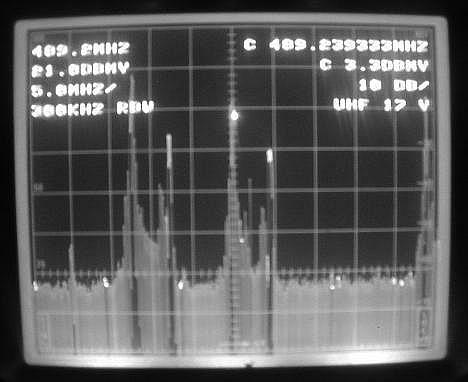 While the +3.3 dBmV signal level, recorded at the end of the 400’ antenna downlead, produced excellent picture quality on the screen of the low noise figure color TV monitor, this signal level was short of the +20 dBmV input requirement to overcome the noise generated by the UHF demodulator. The application of a Channel 17 preamplifier seemed mandatory. The classical distant UHF station reception principle calls for the installation of a single channel, high-gain, low noise preamplifier. However, that would prevent the simultaneous reception of Channel 17 and Channel 54 - a significant cost savings. Replace the single channel preamplifier with an antenna-mounted wide-band UHF preamplifier. Use a wide-band preamplifier, inside the head-end, at the end of the antenna downlead. Install a two-way splitter at the input of the parabolic, attaching separate, single channel preamplifiers at the output ports of the splitter. Use a two-way splitter at the end of the antenna downlead, followed by the single channel preamplifiers. There are no rules, equations, charts or diagrams determining the best choice from the above alternatives. A properly conducted initial engineering study may discover in advance certain interference problems, as well as the presence or absence of co-located HDTV transmitters. On the other hand, no theoretical study will replace the expertly conducted on-site tests and measurements obtaining optimum results. The installation of separate analog and DTV antennas is neither financially desirable nor acceptable for an already heavily loaded antenna tower structure. To make the life of the head-end engineer even more miserable, TV stations have a habit of changing tower-locations, output power, and last but not least channel assignments. The re-assignment from Channel 19 to Channel 58 could be annoying. However, shifting from UHF to VHF, Channel 19 to Channel 9, that can become a real shocker. Now, that the HDTV roll-out is firmly underway, engineering executives and/or head-end engineers should not delegate the multi-channel UHF reception concept into the “weather” category. Everybody talks about it, but nobody does anything about the weather.